The European PP and PE markets have been hit by production issues ahead of April, according to ChemOrbis. Adding to the prevailing supply constraints, the recent force majeure declarations are being cited as the main factor that is expected to lend support to higher PP and PE prices next month. Borealis declared force majeure on PE and PP output from its Schwechat site in Austria because of a force majeure issue at its monomer supplier. The company operates two PP plants, an LDPE plant and a swing PE plant at Schwechat. Versalis has also declared force majeure on PE from their Dunkirk site in France due to a monomer shortage. The company has a capacity to produce 210,000 tons/year of LDPE and 140,000 tons/year of LLDPE at Dunkirk. LyondellBasell declared force majeure on HDPE supply from Munchsmunster, Germany, according to reports this week. The company was said to have faced production issues at the 320,000 tons/year plant last week. Meanwhile, it is unclear whether LyondellBasell had lifted the force majeure on PP output from their Ferrara, Italy and Tarragona, Spain sites declared last month. In addition to the force majeure declarations, a Central European producer is expected to conduct a planned maintenance shutdown at their 280,000 tons/year PP plant in April, according to players in Europe. A distributor in France sold out his March PP allocation with hikes of €150/ton after his West European supplier closed its order books as of March 11-12 as per ChemOrbis pricing service. The seller expects to see higher prices next month, considering that availability constraints will remain in place. 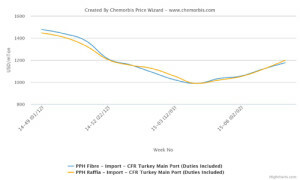 A German distributor issued further hikes of €50/ton on his PE prices compared to the beginning of the month citing tight supply. The seller was informed by his West European supplier that they would seek a new round of increases on their April PE prices regardless of the monomer contracts.